Bring your students to the Art Museum for a self-guided visit of your own design or a docent-led tour with one of our trained guides. Please submit a reservation request at least four weeks in advance. School tours are currently available to reserve through June 7, 2019. Summer 2019 tours will become available to book after May 6. The exhibition the map is not the territory contains a multimedia piece that visitors are invited to move through in the Sculpture Court between the two lobbies. The piece features moving images projected onto scrims, walls, and floors. The exhibition space has low lighting, and the projection features bright lights. It also contains a soundtrack with ambient sound. Staff are happy to assist and if you have questions before you visit, email access@pam.org or call 503-226-2811. New this year: All docent-led school tours are organized by theme, such as “Expressing Identity” or “Places,” rather than by collection area. Tours may include any permanent collection or special exhibition, but will not stay exclusively in that area. For example, a tour with a Native American art emphasis will include 2 – 3 stops in the Native American art galleries and 1 – 2 stops in other collection areas. This approach supports meaningful cross-cultural connections on tours, deepens the tours’ central ideas, and helps us accommodate more groups in our limited gallery space. To request a specific collection area or exhibition, please make a note in the comments box on the final page of the online reservation request. In addition, the Education Department is in the process of reviewing student learning experiences in the Native American galleries. We will be listening to Native artists, educators, students, and community members in advisory sessions over the coming year. A new Native American Art Curator will join the Museum in July 2019 and will play an important role in this review. We are also attuned to changes in the statewide curriculum. In response to Senate Bill 13, the Oregon Department of Education is in the process of writing new curriculum relating to the Native American experience in Oregon for K – 12 classes across five core subject areas. We will be closely following their work. We welcome your feedback and support in this process. Please send your thoughts and questions to education@pam.org. If the standard tour times do not fit your needs, please select the closest option and indicate your preferences in the comments box. Self-guided groups are not admitted before 10 a.m.
For additional information, reservation instructions, driving and parking directions, please refer to our FAQ page. 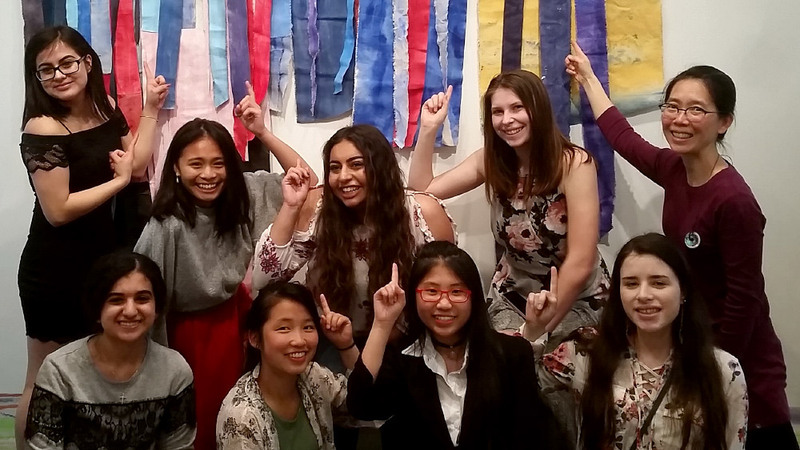 Gresham High School students celebrate their artwork with teacher Hoan Tran in the exhibition Marvels. Bring docents to your classroom for lively, in-depth arts engagement in advance of a Museum tour. Limited spaces available. 4 weeks advance notice required. Questions? Please contact Alex Haynes for more information. We are currently only offering the Expressing Identity classroom program. There is a suggested fee of $25 per classroom visit to cover the cost of materials. Students, teachers, and special aides are free with advance registration. Chaperones are free up to a 1:6 adult to student ratio. Additional chaperones will be asked to pay regular admission of $20 per person. Docent-guided tours engage students using an interactive, conversation-based approach. Docent-guided tours are offered Tuesday through Friday (School Tour Options) and require a 1:10 adult to student ratio. Students must be at least 5 years old. Self-guided school tours are offered Tuesday through Sunday. If the standard tour times in the online system do not fit your needs, please select the closest option and indicate your preferences in the comments box. Self-guided groups require a 1:6 adult to student ratio and are not admitted before 10:00 AM. Homeschool groups are welcome for both self-guided and docent-led tours. Please see the guidelines above. For docent-led tours, we ask homeschool groups to divide the students by age so that each docent can plan age-appropriate activities. In the comments box on the reservation form, please provide a breakdown by grade level (eg., 3 fourth graders, 5 kindergarteners, 3 seventh graders, etc). Also, please let families know that children will be broken up by age group, so siblings may not always be together. Finally, it important to provide an accurate number of students in the reservation. Please notify the Museum at least two weeks in advance of any changes to the number of tour participants. College class visits are $2.50 per student with advance registration, or free with the College Creative License. The College Creative License offers one year of Museum admission and other benefits for $20. Faculty may purchase College Creative Licenses in bulk by sending students’ first names, last names, email addresses, and zip codes to hana.layson@pam.org. Bring your students to the Art Museum for a self-guided visit Tuesday through Sunday. Students, staff, and chaperones (up to a 1:6 adult to student ratio) are free. Advance registration and a 1:6 adult-to-student ratio required.